This charming vintage folding map published by United Airlines draws on traditional cartography styles as well as more modern ones. 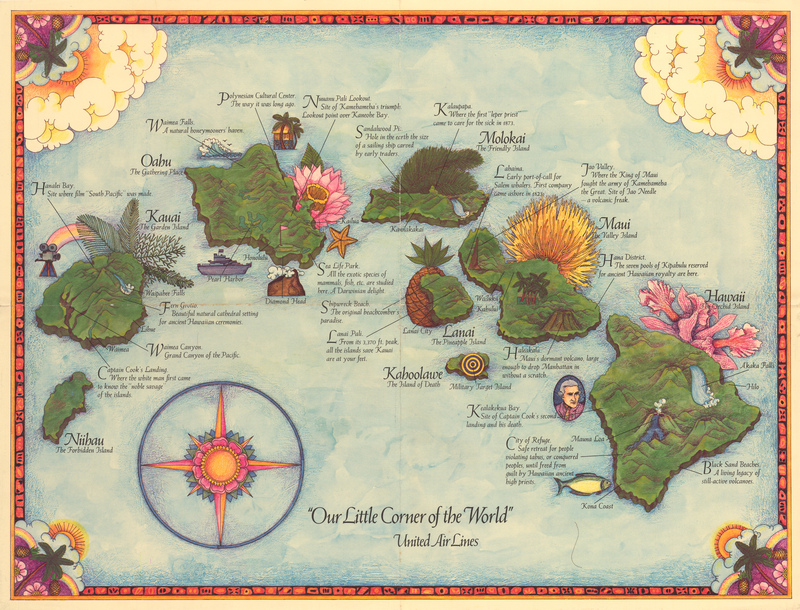 The map depicts Hawaii the group of lush green islands and adds commentary to each. Hawaii itself is called The Orchid Island, with a lovely large orchid near its name. On Hawaii itself Mauna Loa, the Black Sand Beaches, and the Akaka Falls are illustrated, as is Kealakekua Bay, the site of Captain Cook’s second landing and his death. Also noted is the City of Refuge, a place of safe retreat for both people violating tabus, and conquered peoples who could only be freed by Hawaiian high priests. Maui is called The Valley Island. Few landmarks are indicated. Among them are Haleakala, the island’s dormant volcano, which is said to be large enough to drop Manhattan in, and the Hana District where the seven pools of Kipahulu which were said to be reserved for ancient Hawaiian royalty. The Jao Valley is depicted, which is noted for a great battle which was fought there, and an interesting geologic phenomenon call the Jao Needle is depicted, and called a volcanic freak. Each of the remaining larger islands is thus described, while the smaller ones are named and show little detail. Condition: This colorful folding map is in A condition.